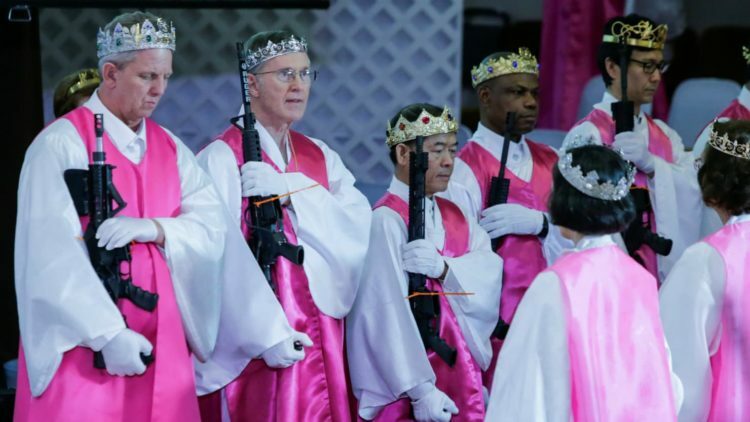 Crown-wearing worshippers of World Peace and Unification Sanctuary in Pennsylvania, United States scared the hell out of people and a school on Wednesday, when they arrived the church, each clutching an AR-15 rifle. Brides were clad in white and grooms in dark suits, all arriving with dozens of AR-15s, though unloaded. Inside the church, they drank holy wine and exchanged or renewed wedding vows in what was called a commitment ceremony, which also doubled as an advertisement for the Second Amendment. Though the state police kept watch as the ceremony unfolded, neighbours were not at ease. A smattering of protesters stood outside the church and a nearby school cancelled classes, the AP reported. 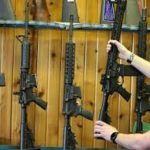 The church, which has a worldwide following, believes the AR-15 symbolizes the “rod of iron” in the book of Revelation, and encouraged couples to bring the weapons. An AR-15 was used in the Florida high school massacre on Feb. 14. Moon is the son of the late Rev. Sun Myung Moon, a self-proclaimed messiah who founded the Unification Church, which critics regard as a cult. The younger Moon’s congregation is a breakaway faction of the Unification Church, which had distanced itself from Wednesday’s event. An attendant checked each weapon at the door to make sure it was unloaded and secured with a zip tie, and the elaborate commitment ceremony went off without a hitch. Some worshippers wore crowns made out of bullets. But Wednesday’s event, coming on the heels of the high school massacre in Parkland, Florida, which killed 17, rubbed emotions raw. The ceremony prompted Wallenpaupack Area School District to move students at an elementary school down the street to other campuses.